Knowledge for Change (K4C) has over 6 years of experience of running student placements in low and middle income countries, hosting over 300 students from the UK, USA, Australia, Kenya, Poland, Norway and the Netherlands. 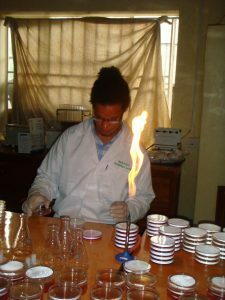 Over the years, our placement projects have been supported and promoted by world renowned organisations such as Health Education England, the UK NHS Blood and Transplant Service, the UK Department for International Development, the Royal Colleges of Midwifery, Nursing, Obstetrics, Anaesthetics, Paediatrics and Child Health and more than 10 international Universities from around the world. All our placements are organised through negotiation with prospective students and our in-country partners. Students have the opportunity to make a real difference to the facilities within which they are based, contributing to sustainable and meaningful long-term projects run by K4C. As a registered charity, ethics and sustainability are at the core of all of K4C’s projects and activities; we do not make any profit and endeavour to invest any surplus funding into achieving our charitable objectives. We are currently able to offer placements in Kampala and Fort Portal in Uganda. We welcome students from any study discipline and level of study including medicine, nursing, midwifery, allied health professions, social work, biochemistry and microbiology. We endeavour to design a stimulating, meaningful and effective placement which suits your needs and interests. Our bespoke placements align your own personal and professional interests with the long-term strategy and values of K4C and our partner organisations. Placement locations include ward and operating theatre based placements in large urban hospitals and small rural health centres; community outreach programmes with local non-governmental organisations (charities) focusing on mental health, children’s health and women’s empowerment; teaching placements in local Universities; placements in prisons, juvenile centres and refugee settlements; placements in schools for disabled children and children’s development centres. Where possible, students are able to experience multiple placement locations depending on the duration of their placement and the needs of our partners. You can complete a placement for any length of time (min. 2 weeks). 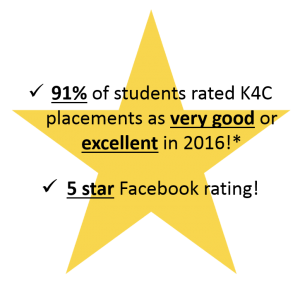 To hear what past students had to say about their placements with K4C, click here to watch our most recent evaluation video (opens new window). 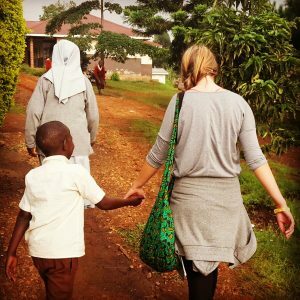 Why do a Placement with K4C? 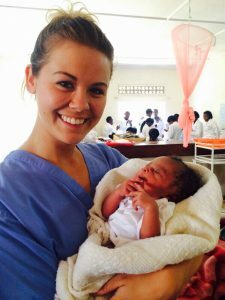 Our placements save you money: The placement we offer are far cheaper than other private companies found online, and the money you pay goes towards improving healthcare systems in developing countries instead of high staff salaries and administration costs. You will gain greatly beneficial knowledge, skills and experience: over 80% of students thought their placements in Ugandan and India had a ‘strong’ or ‘very strong’ impact on their skills in areas such as communication, compassion/empathy, resource awareness, cultural awareness and health systems thinking. 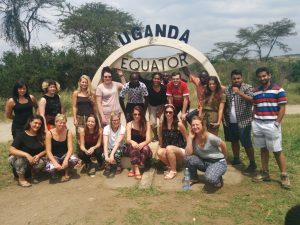 You will have the ability to make a real difference: students are not ‘fly on the wall observers’ during placements; they get stuck in under direct, high quality supervision from our British professional volunteers and local Uganda partners. This is why 91% of students who completed a placement with K4C in 2015/16 believed they’d had a ‘positive’ or ‘very positive’ impact on the individuals, facilities or health system within which they were based. Our placements are safe: all placement locations, accommodation and travel arrangements are fully risk assessed to ensure your comfort and safety. Support is provided where necessary by our professional long-term volunteers and our in-country project team who will be with you for the duration of your placement. Our placements are fun and exciting: you will have the opportunity to meet many new and interesting people throughout your placement. You are also free to do as you please on evenings and weekends; the more adventurous travellers often go mountain hiking or on safari park adventures deep into the African bush. Others prefer to relax in the sun by a beautiful lake or swimming pool at plush lakeside lodges and hotels. Whatever your preference, we are happy to advise and assist you to minimise costs and maximise enjoyment! What Support and Supervision will be available if I need it? For more information on our staff and professional volunteers in Uganda, click here (opens new window)! How much do placements cost? 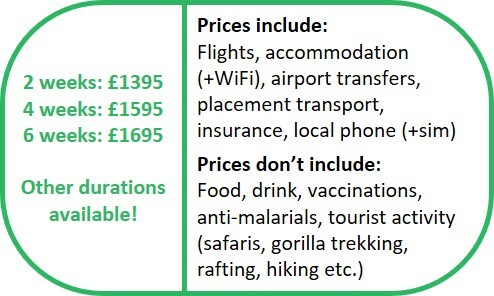 As a charity, K4C does not make any profit from running student placements and we keep the prices as low as possible to be able to cover our costs. A minimum of £150 per student is invested in local health facilities, along with any other surplus in funding generated from student contributions. The amount paid by students also funds posts for long-term professional volunteers who not only supervise students whilst on placements but also make a real difference to local facilities, their staff and patients as a result of their training, mentoring and co-working. We welcome students from outside of the UK – if this applies to you, please contact us via email for more information. as possible, we regularly offer grants and bursaries that you may be able to benefit from (eligibility criteria do apply). However, these are by no means the only funding streams available should you not be eligible, or fail in your application – the majority of universities have their own travel funding available for their students, so start by asking international offices, placement managers and personal tutors. External funding can also be found by asking friends, colleagues, tutors or searching on Google! If you have any questions please don’t hesitate to get in touch! How can I find more information or apply?